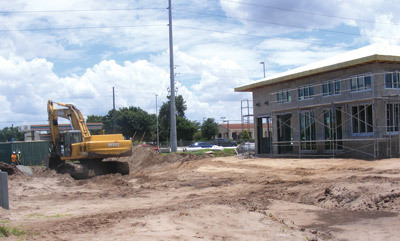 The Big Bend Road and U.S. 301 intersection will have yet another choice of food by the end of summer as a PDQ traditional American sandwich restaurant is being built at 10441 Big Bend Road. The tentative target date for opening is Aug. 17. Residents living near the Big Bend Road and U.S. 301 intersection didn’t even have a grocery store 10 years ago, but now they have a full array of goods and services on all four corners. With Winn-Dixie’s recent purchase of Sweetbay grocery stores, there’s a Winn-Dixie and a Publix to choose from as well as several hair and nail salons, a UPS store, liquor stores and shops, shops, shops. But the main attraction at the four-corner area seems to be its restaurants, with a variety that includes Chinese, Japanese, several dueling fast-food restaurants, a Sonic, Beef ‘O’Bradys, a Caribbean eatery, East Coast Pizza and two other pizza choices, and larger restaurants as well, including Applebee’s, Buffalo Wild Wings, Panera Bread and the Village Inn. Going from zero to 12 restaurants in fewer than 10 years — mostly in the past five — has given residents a wide choice to tempt their taste buds. And yet another restaurant, from the fast-growing chain PDQ, is going up between Walgreens and the highway on the southwest corner of the intersection directly in front of Sam’s Club. Not really stating what PDQ stands for, Reader and Basham pleasantly refer to it as meaning “People Dedicated to Quality,” but say that’s not a formal name. PDQ will serve traditional American sandwich-style foods in a 4,800-square-foot stand-alone building that will also include a drive-through window, takeout platters and catering. With PDQ’s concept of fresh food, there are no microwaves or freezers in any of its locations. Since PDQ restaurant first opened its flagship restaurant in Tampa in 2011, the chain has grown quickly, according to Mickey Chard, who will manage the restaurant at 10441 Big Bend Road in Riverview. A hiring station will open in a storefront at 11337 Big Bend Road by the end of June, and the target date for opening the restaurant is Aug. 17. So far, Florida has been a popular target for PDQs — with new restaurants in Carrollwood, Wesley Chapel, Sarasota, South Tampa, St. Petersburg and West Palm Beach. The local hiring number will be 813-864-8006, but as of press time June 24, there was still no machine or person answering; just a continuous ring.